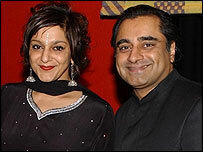 Actor and writer Meera Syal has married her Kumars co-star Sanjeev Bhaskar in a simple family ceremony. The couple, who star together in the BBC comedy the Kumars at Number 42, married on Friday. They have known each other for more than 10 years and first worked together on the Radio 4 comedy Goodness Gracious Me, which later switched to BBC Two. It has been reported that Syal and Bhaskar have been together for almost two years. A statement issued by Syal's agent said: "Following enquiries, Sanjeev and Meera are happy to confirm that they did get married last week at a very quiet, family only ceremony." In the Kumars, Bhaskar, 40, plays a chat show host struggling to interview guests while his family constantly interrupt. He also writes the series. Syal, 43, plays his grandmother in the hit comedy.